The windlass install is complete. In this shot the chain, solenoid, motor, and gearbox are visible. This project was complete on 5/10. We decided to replace the old windlass on 4/19 and started the project with 4 days of dis-assembly. 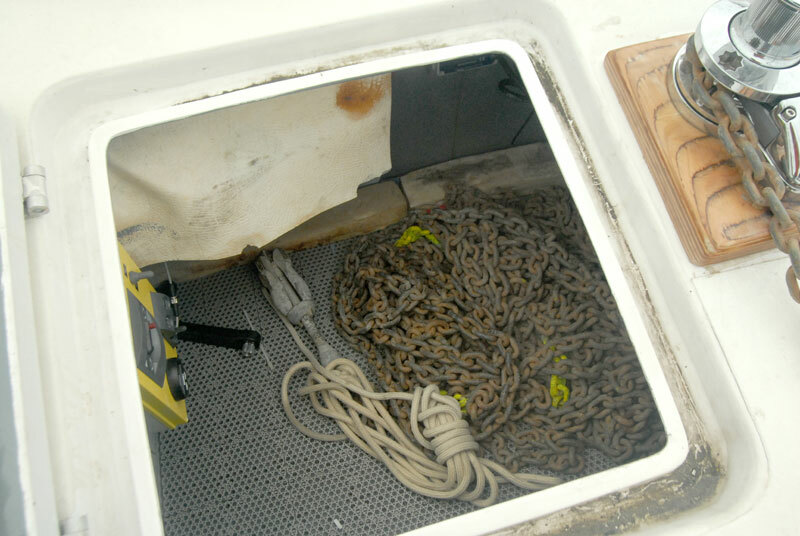 The old windlass was a Diport AG with a much larger footprint and easily twice the weight. Two design flaws made the old windlass not worth the effort to try to keep it running. 1) Ease of maintenance and 2) the capstan would not operate independently of the gypsy due to the re-engineering of the clutch tension mechanism. Further, obtaining any parts for it would involve going to a local tool and die shop for some custom fabrication. I had a plastic box on the boat from the previous owner and often wondered what I would ever do this thing. So now it has found a home in the anchor locker. The layout of the components from top left is the main breaker, the “power switch”, the Chain/Rode counter, and an Up/Down switch. 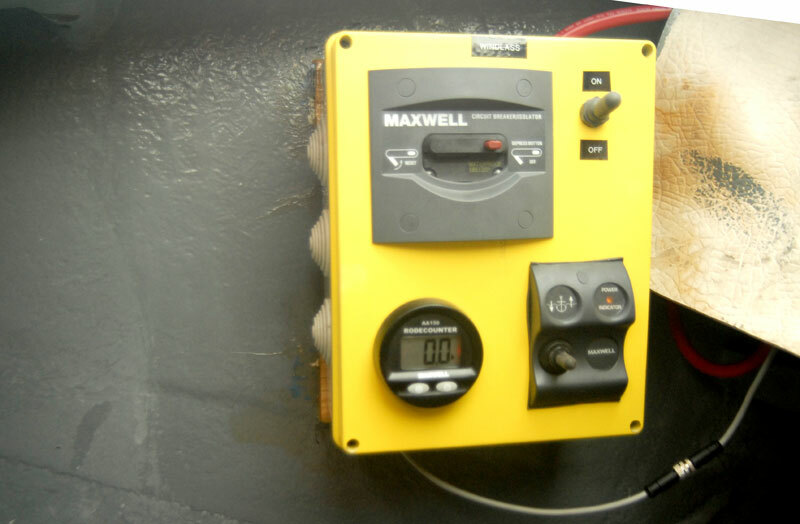 The Up/Down switch allows you to operate the windlass while you are coiling line or chain. Of course we still have the deck mounted foot switches. 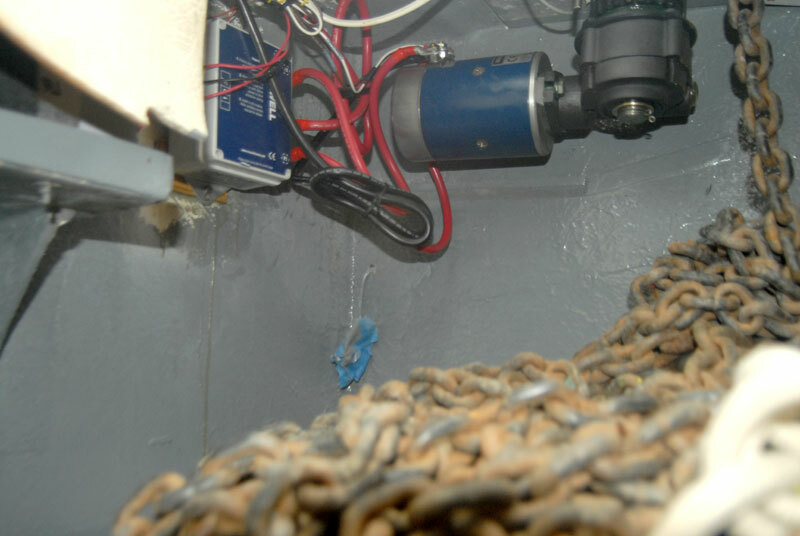 This is a picture of the chain locker from above. The little anchor is the dinghy anchor. This is the almost finished installation. I am going to use my Dremel tool to shape some Starboard as a rub guard for the leading edge of the windlass mount. So, once I have that ready we will re-paint this area with Awlgrip (including the mount) and then fasten the rub guard on the mount. Now we have about $1,800.00 in parts and the bigger number is the labor. If this project had just been to replace the windlass with a new windlass of the same make and model the project would have taken about a day. In this case we had to completely dis-assemble the old windlass, do deck work, create a new deck mount, dry-fit, and completely re-wire a new system. There are two yards in this area that I would trust with a job like this, one is Tidewater Yacht Service in Baltimore and the other is Georgetown Yacht Basin. This is basically a one person job and the yards charge that at approximately $100.00/hour. So roughly speaking about $1,000.00/day. This is a 7 or 8 day job so I’ll estimate 7 days labor. BOOOOM. BOAT! Break-Out-Another-Thousand. So the grand total for a yard to do this job is nearly $10,000.00. 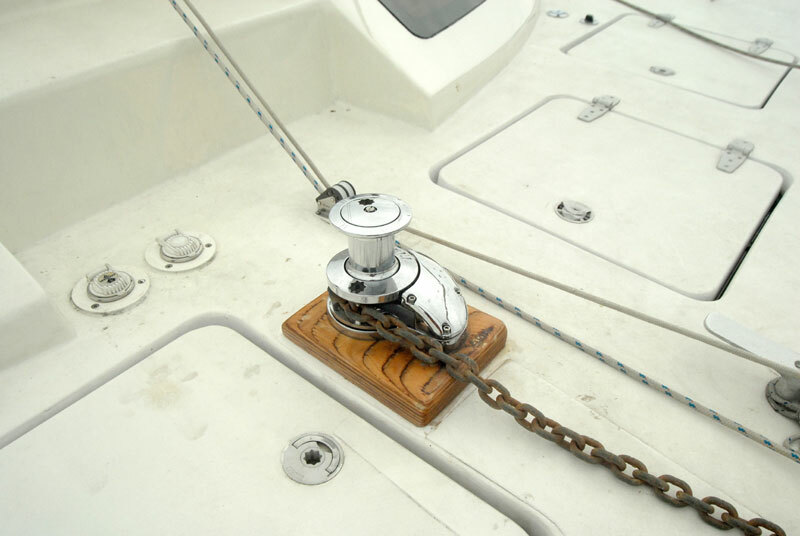 This a very smooth functioning windlass and Maxwell makes it pretty easy to maintain. The capstan and gypsy can be used independently by using a winch handle to relieve the clutch tension. We tested this installation by paying out all the chain. The counter shows that we have about 140′ of 10mm chain. I’m thinking that we should add some line rode which we can now do because the gypsy will accept 10mm chain and 5/8″ rode, but we’ll save that for another day later in the summer and only if it appears that we will be heading south for the winter. We’ll be testing this installation over the summer.